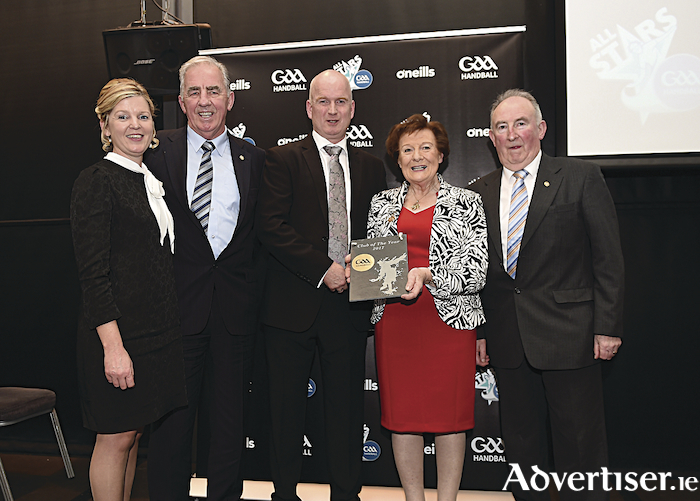 Moycullen committee members Imelda Mulkerrins, Morgan Darcy, Brian Mulkerrins and Tony Audley accept the 2017 Club of the Year award from Patricia Woods (MII sponsors). Photo: Tommy Grealy. The Galway hurlers defeated Laois last weekend by 2-18 to 0-17 in round two of the 1B league. Galway led by 2-06 to 0-10 at half-time, courtesy of goals from Kinvara’s Conor Whelan. Laois really tore into Galway in the second half and pushed the visitors hard, but scores from Padraig Mannion, Aidan Harte and Conor Cooney left Galway with full points from their first two games. The hurlers are on a break this weekend and will take on Offaly at home on February 18 in Pearse Stadium, with Dublin and Limerick to follow in round four and round five. Galway are still without key players such as Joe Canning, David Burke, Gearoid McInerney and Daithí Burke and it will be interesting to see when those four All-Stars will be back in competitive action.